Dimensions (HxWxD): 1.25" x 0.45" x 0.4"
This beautiful 19.3 carat Twin Vera Cruz Amethyst Isis Pendant, which is 1.25 inches in height, exhibits a luminescent deep violet color has been hand crafted exclusively for Satya Center. It hangs from a 14 karat gold filigree bale cast with flower & lace designs, and comes with a YGF chain in a velveteen jewelry box for safe keeping. 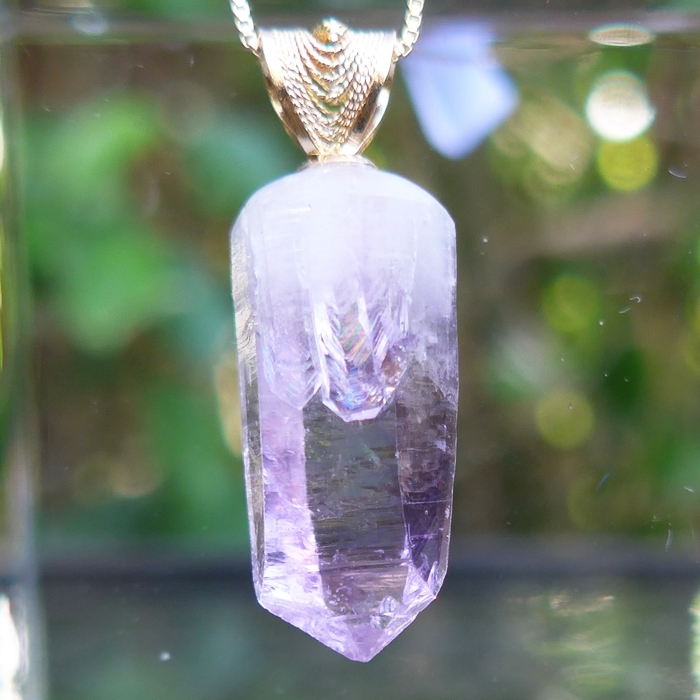 This gorgeous Twin Vera Cruz Amethyst Isis Pendant exhibits a small twin crystal near the base of the shaft, and trigonal temple markings on two faces of the termination tip, along with a prominent pentagonal face opposite a triangular face, marking this specimen as an Isis crystal. This beautiful pendant comes from Vera Cruz, Mexico. Vera Cruz amethyst has a tendency to be of lighter shades and typically quite translucent. The darker stones are considered more powerful and more valuable. Vera Cruz amethyst comes from mines that were basically played out ten years ago, according to our wholesale sources, so it is rare and valuable. This stone has been in our collection for many years and now we offer it to the public. 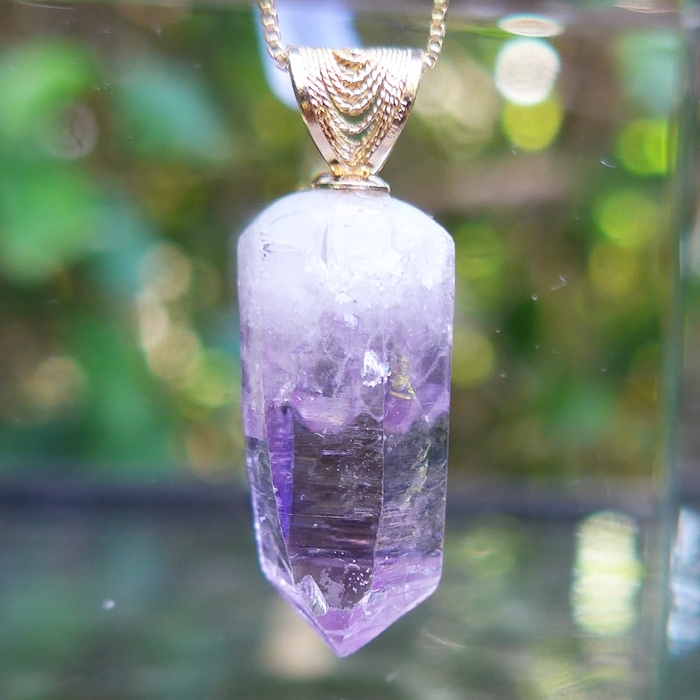 We prize the ultra-high frequency vibrations of this unique crystal, because it resonates with the energy signature of the Violet Flame of St. Germain. Isis crystals like this one have one or more pentagonal or five sided faces opposed by three sided faces, & can assist us in connecting with the Divine Mother. Isis was known as the Egyptian Queen of Magic and Giver of Life. 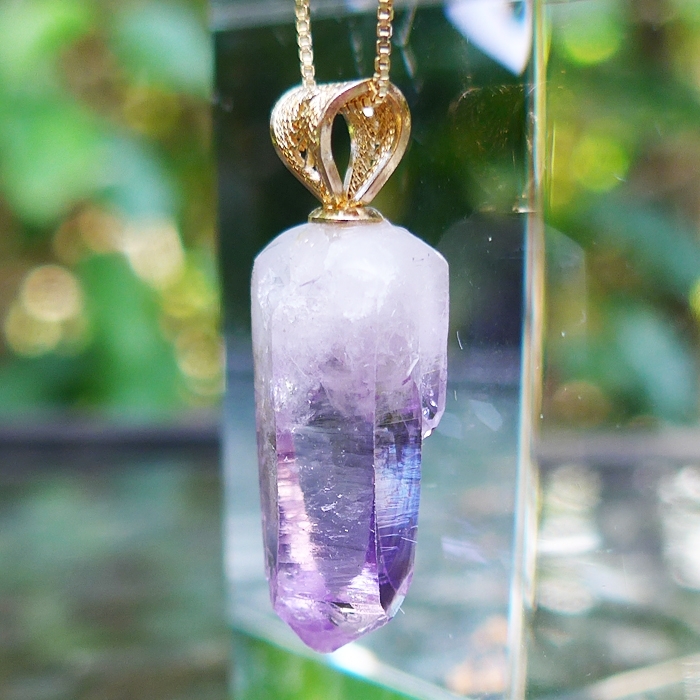 For both men & women, such a crystal can help to balance the male/female aspects of our beings or bring in the qualities of the Divine Mother: nurturing, strength, self love, Universal Love & compassion. Isis crystals can help to foster the native intelligence we all have, called Intuition. The Ascended Master who is Master of the Seventh Ray is Count St. Germain, the eighteenth century reincarnation of the Western Mystic and Adept Christian Rosenkreuz, apochryphal founder of the Rosicrucian Order. The Seventh Ray focus greatly on the use of ceremonial magic and alchemy to purify and transmute the lower, animal instincts of humanity into higher impulses, higher thought-forms, more evolved emotional states, and more purified energetic signatures at all levels of being.In the pantheon of modern day New Age Guides and Teachers, the Count Saint Germain is called "The World Teacher" and "The Master of the Violet Ray" and is thought to communicate mind-to-mind with many, many students around the world. There is thought to be a large contingent of his students alive today in the United States, the center of modern Empire, just as Paris was the center of European Empire at the time of St. Germain. Note: Above weight is shipping weight. Net weight is 3.86 grams, or 19.3 carats.